It’s rare we’ll find rock artists, even really early on like this, who started off on the fringes of the style, particularly leaning uncomfortably towards pop, who over time consciously moved further and further into full-fledged rockin’ and rollin’. If anything the reverse is usually true. A list of artists we’ll come across who started off rockin’ and then “matured” and left rock far behind runs the gamut from Bobby Darin and Gene Pitney to Chicago and Whitney Houston. It’s just the more natural progression. Pop is more respectable, for years it was seen as having a broader audience and wider appeal. Rock was just something you listened to when you were young and soon outgrew. There’s a reason why rock artists have their strongest years when they’re young themselves and why most of them are at risk of being forgotten by the time they hit thirty and a new generation of fans come along who couldn’t care less about them. Rock’s greatest asset as a whole, the very thing that keeps it relevant as a style over nearly seventy years to date, is the fact it embraces the new above all else. That constant turnover allows each successive generation to embrace it as their own, each with their own new stylistic wrinkles, new sounds and – most notably – new stars. If you’re looking for rock artists with longevity chances the only places you’ll find them is with touring acts who allow aging audiences to go back in time for one night and relieve those bygone years when they both were young – artist and listener alike. Otherwise you’ll find that formerly rebellious rocker who once frightened adult society with their very presence on the scene has moved further into the pop realm. Hell, even Elvis Presley wasn’t immune to that trend and, like so many who followed, from Phil Collins and Stevie Wonder to Eric Clapton, Rod Stewart and Tina Turner, more recently P!nk, the way to keep on selling records as you creep up in age and your original rock audience grow up and start having kids of their own is NOT to try and make a futile awkward appeal to their kids, but rather to allow yourself to age along with your fans and leave the more juvenile sounding rock to the youngsters. In other words, you start leaning pop. Which is why the career course of The Treniers over their first decade is somewhat backwards… completely warped even. For The Treniers flirted with, if not actually HAD, genuine pop appeal or at least a measure of success in the adult nightclub world before rock came along. Yet when it DID come along The Treniers didn’t scoff at it like most of their peers did, they gradually moved into it, eventually embracing it openly and succeeding even more because of it until they were simply a rock group, no asterisk needed. In all of rock history they’re virtually alone in this regard. But at this point in history, as June turned to July in 1948, that decision had yet to be fully made. They’d taken a step or two in that direction already but didn’t seem ready to fully commit to it yet, which is perfectly understandable. After all, a new “fad”, which let’s face it is all rock could reasonably hope to be considered heading into the summer of ’48, is always an uncertain thing and thus ripe for a little bit of humor at its expense. A more established act adding a dose of whatever the latest flavor of the month is to its routine to both show an awareness of current trends but also to ultimately dismiss them by poking fun at them. Usually that’s a sign the act in question is about to be obliterated by the onrushing tidal wave of the new style. But The Trenier Twins were different. They were hardly pop stars, nor really had any chance to ever be ones due to their race if nothing else. But they’d found a formula which at least allowed them access to a type of pop appeal by incorporating frantic stage show as their act. That was what had got them noticed back when they worked with swing king Jimmie Lunceford. That’s what gave them a successful club act, playing to a classier and higher paying clientele than the juke joints on the chitlin’ circuit could offer. They were good singers but even better showmen and so they seemed destined to be something of a gimmick. A pop act with a unique twist. When the twins went out on their own in 1947 they looked to find songs that would allow them to convey on record what they did so well on stage – clown around and create excitement, as well as surprise you by delivering a more than halfway decent rendition of the actual song. So a few months later when rock ‘n’ roll emerged with its unhinged approach it proved appropriate for their needs and they tested it out back in the fall with moderate success. But now, by their third try at trying to hit on the precise combination required to make it successful, they’re beginning to meet with diminishing returns, not just commercially but creatively as well and it looks as though their experiments might have to be scrapped altogether. That’s the part that is so disappointing with this record and The Treniers progression as artists at this point. Convertible Cadillac (not “My Convertible Cadillac” as most re-issues have as the title) has the requisite parts to work well had they jumped in with a bit more conviction but frustratingly they hold back yet again. Looking for a way to present their on-stage roles within the song – that of Claude, the crooning straight man and Cliff the wisecracking comic – they essentially affix a very bland, tepid arrangement to it to emphasize the orderly approach their antics will attempt to upend. It’s something that may work well on paper but not so much on record as they don’t seem to really know WHAT to do to convey the on-stage mayhem their live act relied on. The lyrics have good potential to showcase the ostentatiousness that would become one of rock’s enduring qualities, as Claude wants to go back to his hometown and show off his success as exemplified by the gaudy car he drives. But he reins it in to allow Cliff to make the snide comments in response which keeps this car in first gear for far too long. The musical arrangement is like an underpowered engine holding this car back even more. Saxophonist Don Hill, a great player who’d go on to do some truly inspired honking as their primary musical antagonist over the years, tootles along in uninspired fashion, sounding as if he’s falling asleep at the wheel with his listless playing on the intro. Claude’s vocals don’t light a fire under him when he pulls out of the driveway either, offering the backstory in almost tentative fashion, giving absolutely no indication of where this is all heading. It’s the musical equivalent of being stuck behind Mrs. Mendlebaum driving 25 MPH down a public street who’s barely able to see over the dashboard while the cars behind her lean impatiently on their horns and hop the curb to drive around her on the sidewalk so they won’t miss getting to their destination before it closes for the season. When Cliff makes his first appearance you actually think it must be the engineer in the booth heckling the singer on the studio floor because he finally got bored out of his skull! But alas, it’s not joke, this is the “real” take on it and by the time the far-too jazzy guitar solo in the break comes along it actually has the effect of shifting things into neutral, if not putting it in reverse. Somebody call a tow-truck because this car has stalled in the breakdown lane. Only after coming out of that instrumental break do the boys start to step on the gas some but by now it’s too late to get up to speed. Claude’s decorum begins to unravel and he starts to get more full of himself as they near their destination as Cliff alternately eggs him on and begs to be a witness to the showboating when his brother rolls into town. The flagging energy consequently picks up a little and you can at least get some indication of the source of their appeal and what they were hoping to convey all along. On stage, with physical humor adding to the descriptions, it might come off a little better. Maybe when not confined to three minutes on a record they’d let the more humorous coda go on a bit longer and inject some more ad-libs and silliness to the performance. But here they waited too long to get off the line and promptly got passed by every car on the road and by the time they start to rev things up it’s too little, too late, the race is over. That’s not to say it couldn’t have worked had they taken the car in the shop and retooled it with a more powerful musical engine. If they were hell bent on maintaining the earnest straightforward delivery of Claude to start with they could’ve had him being overrun not just by Cliff’s wisecracking interjections but also by far more aggressive musical breaks that takes the breaks OFF the car, allowing it to roar ahead, change lanes and take the curves at unsafe speeds with Cliff essentially stomping his foot on the gas pedal with unrestrained glee while Claude furtively keeps pumping the breaks, getting more and more disheveled as they go careening along. That might’ve been a ride worth taking. Even more appropriate for the song’s storyline would’ve been start off with Claude’s boastful persona taking center stage and then as the song goes on deflate his ego with humor… have him hot-rodding around in his flashy new car trying to impress the girls he passes on the corner who promptly shoot him down, then see him rolling into his hometown and having the car break down as passenger Cliff asks where the smoke is coming from (Did we drive through a forest fire?) and why his side of the car is riding lower when the wheels fall off before they wind up getting a ticket for dropping parts all over the street. By the end his family members who were anxiously waiting to greet him pretend not to even know him as the wreck is hauled away and Cliff asks Claude for bus fare back to the city. The possibilities were endless, the song’s premise in this case was but a mere chassis for them to build upon and yet here they don’t even polish the chrome any. Let’s just hope it was under warranty and they could send it back to the dealer before having to make the first payment on it. So in the end we’re right back in the garage with their career up on blocks for the time being. What had seemed such a natural marriage – the ill-fitting zany pop/swing act and the emerging unhinged rock ‘n’ roll – looks as if it will never fully connect and The Treniers will go down as a quirky hybrid act that missed its mark. Surely if history is any guide (both past and even future history) they’d soon seek alternate forms of transportation after this car broke down and left them stranded on the highway. Hitchhiking back to town they’d sell that model for parts to whomever wanted it and become pedestrians again, forsaking the open roads altogether and walking to the nearby environs of the standard pop field. They’d devote themselves to what had worked in a more limited sense before all this rock nonsense came along, and then over time, as the music world evolved around them, they’d see even that appeal start to wane until they were all but forgotten, just two forlorn men with bus-passes waiting on the corner for their ride to oblivion. In fact that seemed to be what DID happen as we look ahead some. In November they’d re-release this same tune with a new B-side which was pure pop balladry worthy of Frank Sinatra. It looked as if they’d sent up the white flag of surrender, they had tried and they had failed and were now surely admitting defeat. But they did no such thing. It’d take a year of woodshedding with no releases of their own in 1949 before they came back as the 50’s dawned with their two other brothers added into the mix, no longer straddling the fence stylistically. Then they’d take the reins off the band and channel all of their on-stage exuberance onto wax, or at least as close as they could replicate it in the limited confines of a recording studio. They’d use the highest octane fuel they could legally get their hands on and soup up the engine until it was no longer street legal, then take it out to the salt flats and let ‘er rip. Once they did that, abandoning pop and embracing rock wholeheartedly, they never looked back. They still retained the club-act aspect of it, which made them unlike any other rock act of the day, but they were no longer ill-fitting in the format, unsure of themselves as they attempted to make a go of it. They were in it for the long haul. I think it’s safe to say things worked out in the long run as The Treniers got great mileage out of their act, remaining on the stage until 2003 when Claude passed away at 84 years old, rockin’ until the very end. 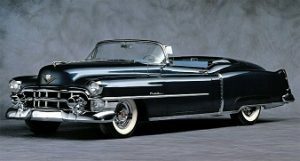 Leave a reply on "The Trenier Twins: “Convertible Cadillac”"